making foam flowers and I have to say...it's a lot of fun. 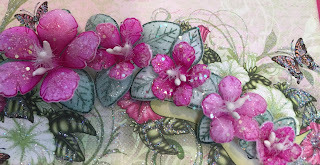 using the new art foam and stamens. Instructions: Create a 6” x 6” white card base and cut a Melon Mambo mat layer 5 7/8” x 5/78”. Trim one of the 6” x 6” panels from the Classic Petunia paper pad to 5 3/4” x 5 3/4”. Adhere the piece of designer paper to the mat layer with dries clear adhesive and then adhere them to the card base. Add untrained transparent glitter all over the design on the paper. Cut another piece of designer paper 5 7/8” x 5 7/8” and adhere to the inside of the card. 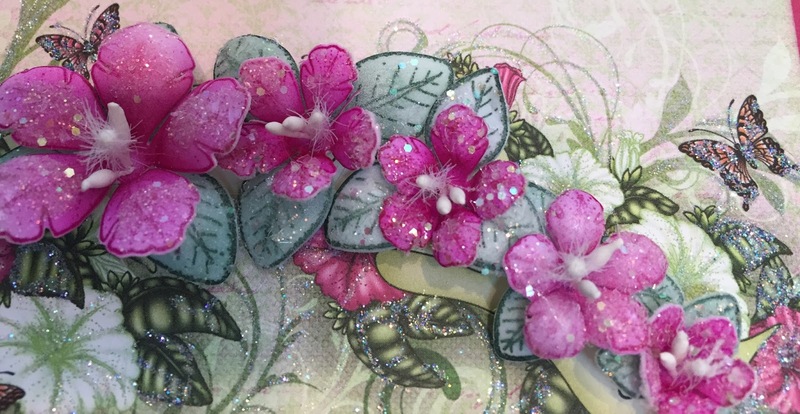 Cut the Window Box Elements from white pearl cardstock, Add dries clear adhesive to a sponge and sponge the beautiful decorative die cut with the glue and then sprinkle with Rajni Chawla’s Crystal Clear. 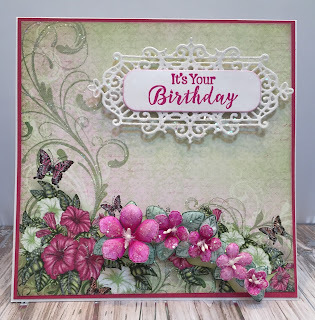 Stamp the sentiment on white pearl metallic cardstock with VersaMark, add magenta embossing powder, heat set and die cut using the Cut Mat Create 1B Die. Ink the edges with Stazon Fuchsia Pink Ink. Adhere the sentiment to the decorative die as shown and add to the card using foam tape. 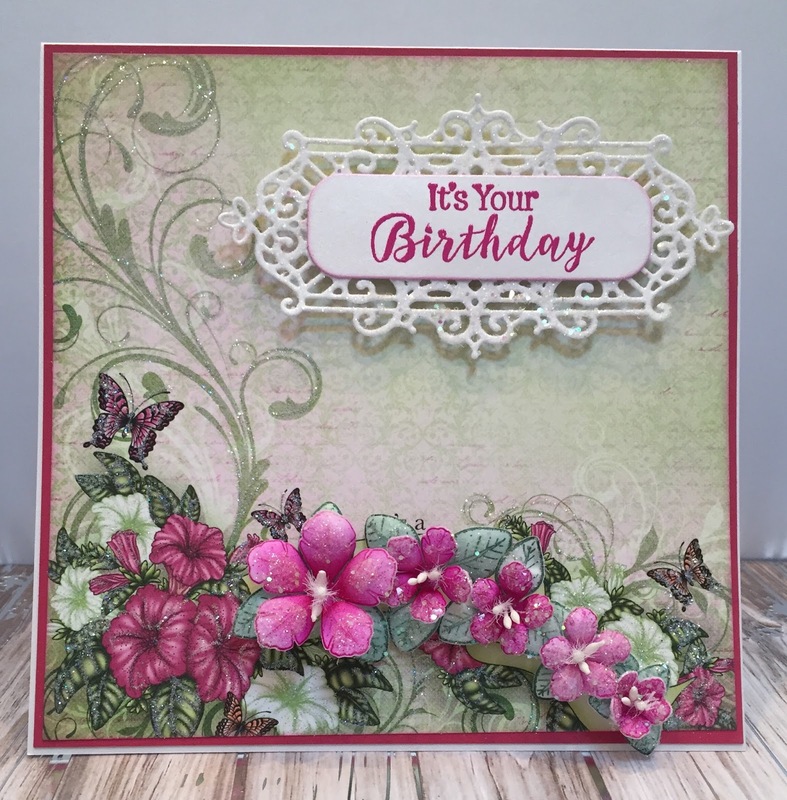 Stamp the Classic Petunias on the Art Foam Paper with StazOn Fuchsia Pink, die cut, color with the same ink pad, and add Rajni Chawl’s Crystal Clear. Heat and shape the petunias using the Heat It Craft Tool. Stamp the leaves with Forest Green StaZon ink, lightly color with the same ink, add crystal clear, heat and shape. Pierce the center of the flowers and add the Bridal Bouquet small stamen. (I add a little dries clear adhesive to the stem of the stamen and let it dry before I thread it through the flower. It’s so much easier this way.) After threading the stamen, add a little hot glue underneath the flower and then trim the stem. Adhere the foam Flowers and Leaves to the card as shown. Thank you so much for stopping by, I really appreciate you! Beautiful card - I love the flowers! Gorgeous card and love the flowers! Beautiful Janet! I love the stamen you used in your gorgeous flowers! Stunning Janet! You did a gorgeous job designing this card - as usual, my friend!